Stir with ice and strain into a chilled cocktail glass. Garnish with a twist of lemon. Always superb! This is one of my all-time favorites. Much depends on the vermouth that you use (Noilly Prat is my favorite dry thus far) and the amount of bitters dashed into this drink simply because the flavors are so subtle. Here, I think, the best of the herbal qualities are brought out in the vermouth while limiting some of the dry white wine flavors that my taste sometimes disagrees with. With the addition of the Angostura, it comes out a wonderfully peachy amber color. Future experimentation would involve different aromatic bitters, I think, starting with Bitter Truth and Fee’s, though I think the more medicinal Angostura works perfectly. I also tried this with Dolin Dry, and was disappointed: the Dolin is too mild, too light, and a Tip Top made with it finishes in an interesting, but not very ingratiating, bread-like aftertaste (of all things). Perhaps a bit of tweaking would save it. I would gladly try some Dolin Blanc in the Tip Top instead. I first discovered this drink while watching Robert Hess’s Cocktail Spirit, though I never got around to mixing it until I wound up with a copy of his Essential Bartender’s Guide, which ups the amount of Bénédictine to 1/4 ounce: a wise decision, I think, as any less would disappear in the vermouth. A little bit more research finds the Tip Top residing in the Old Waldorf-Astoria Bar Book with very similar, though less exact, ratios; Hess mentions that he found it in Albert Crockett Stevens’s “Old Waldorf Bar Days,” from 1931. Regardless of its origins, it appears to be a dry version of the Vermouth Cocktail, which was certainly an old (old old) standard by the 1930s. Besides being an excellent cocktail, the Tip Top is one of the best ways to use up that Noilly Prat vermouth that’s sitting in your fridge. On the rocks with a lemon twist wouldn’t be bad either! UPDATE: September 19, 2011 — I believe I mentioned this elsewhere on the site, but I highly suggest trying the Tip Top with Lillet Blanc in place of the dry vermouth. It turns out wonderfully, and anyone who is not overly fond of vermouth will find it much more enjoyable. I use cocchi americano and it makes for a mind-boggling good drink. I often limit the angostura to one dash, especially when the bottle is halfway full because the dashes are heavier at this point. But yes, one of the great unknown drinks. Still a favorite! And yes — if the Angostura is too heavy, it completely dominates. I haven’t tried the Tip Top with Cocchi…but if I like it with Lillet, the Cocchi is sure to be good. 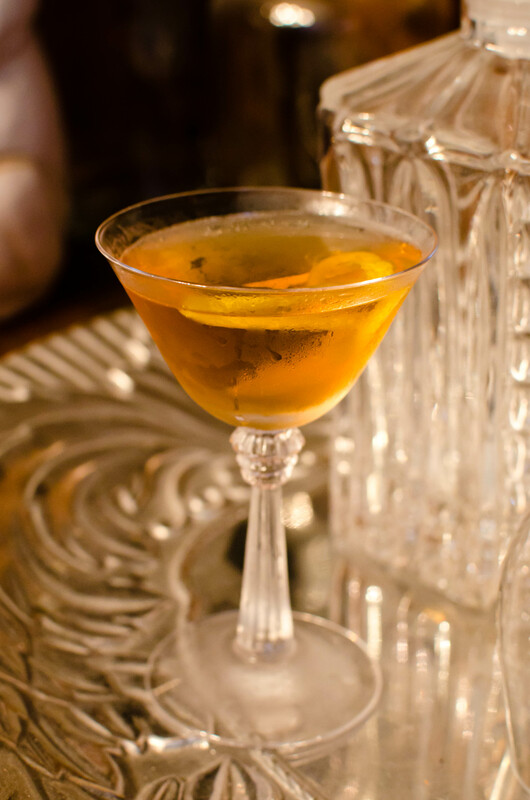 This entry was posted on July 25, 2011 by IJ Lauer in Angostura, Benedictine, Drink Recipe, Dry Vermouth and tagged angostura, benedcitine, bitters, cocktail, dry vermouth, noilly prat, recipe, tip top.